Working in a wide range of genres and budgets with many of today’s top talents, GORE VERBINSKI (Director) is considered one of the most innovative directors of his generation. With seven feature films to his credit thus far, Verbinski’s box-office success totals over $2 billion worldwide. The 2006 release of “Pirates of the Caribbean: Dead Man’s Chest” not only grossed $1 billion around the world, but broke many box-office records, including the first film to break the heralded $100 million barrier in 48 hours. The opening film of this trilogy, “Pirates of the Caribbean: The Curse of the Black Pearl,” was released in 2003 and went on to become one of the top-grossing films of that year, earning a number of Oscar® nominations, including a Best Actor nomination for Johnny Depp. In between the first and second “Pirates” pictures, Verbinski directed the acclaimed comedy-drama “The Weather Man,” staring Nicolas Cage and Michael Caine. The powerful opus about the elusive contemporary American Dream, showcased Verbinski’s versatility. In 2002, Verbinski wowed audiences with the hit thriller “The Ring,” which grossed over $250 million worldwide and made Naomi Watts a household name. Prior to his incredible film success, Verbinski was an award-winning commercial and music video director. His inventive work in advertising for companies including Nike, Coca-Cola, and Budweiser earned him a number of Clio awards. In 1993, he created the memorable Budweiser advertising campaign showcasing croaking frogs. Along with commercials, Verbinski also has seen success in the music-video world directing videos for bands such as Bad Religion and Crystal Method. In 1997, his work caught the eye of Steven Spielberg who offered him his first feature film, the visually stunning family comedy “Mousehunt.” Verbinski is a graduate from the prestigious School of Theatre, Film and Television at UCLA and resides in Los Angeles with his wife and two sons. Great stories, well told. They can be for audiences in darkened movie theatres or home living rooms. They can feature great movie stars or introduce new talent. They can be true adventure, broad comedy, heartbreaking tragedy, epic history, joyous romance or searing drama. They can be set in the distant or recent past, an only-imagined future or a familiar present. Whatever their elements, though, if they begin with a lightning bolt, they are stories being told by JERRY BRUCKHEIMER (Producer), and they will be great stories, well told. The numbersof dollars and honorsare a matter of often-reported record. Bruckheimer’s films have earned worldwide revenues of over $14.5 billion in box-office, video and recording receipts. In the 2005- 6 season he had a record-breaking nine series on network television. His films15 of which exceeded the $100 million mark in U.S. box-office receiptshave been acknowledged with 39 Academy Award® nominations, six Oscars®, eight Grammy Award® nominations, five Grammys®, 23 Golden Globe® nominations, four Golden Globes®, 53 Emmy Award® nominations, 14 Emmys®, 16 People’s Choice nominations, 11 People’s Choice Awards, 11 BAFTA nominations, two BAFTA Awards, numerous MTV Awards, including one for Best Picture of the Decade for “Beverly Hills Cop,” and 14 Teen Choice Awards. But the numbers exist only because of Bruckheimer’s uncanny ability to find the stories and tell them on film. He is, according to the Washington Post, “the man with the golden gut.” He may have been born that way, but more likely, his natural gifts were polished to laser focus in the early years of his career. His first films were the 60-second tales he told as an award-winning commercial producer in his native Detroit. One of those mini-films, a parody of Bonnie and Clyde created for Pontiac, was noted for its brilliance in Time Magazine and brought the 23-year-old producer to the attention of world-renowned ad agency BBD&O, which lured him to New York. Four years on Madison Avenue gave him the experience and confidence to tackle Hollywood, and, not yet 30, he was at the helm of memorable films like “Farewell, My Lovely,” “American Gigolo” and 1983’s “Flashdance,” which changed Bruckheimer’s life by grossing $92 million in the U.S. alone and pairing him with Don Simpson, who would be his producing partner for the next 13 years. Together the Simpson/Bruckheimer juggernaut produced one hit after another, including “Top Gun,” “Days of Thunder,” “Beverly Hills Cop,” “Bad Boys,” “Dangerous Minds” and “Crimson Tide.” Boxoffice success was acknowledged in both 1985 and 1988 when the National Association of Theater Owners (NATO) named Bruckheimer Producer of the Year. And in 1988, the Publicists Guild of America named him, along with Simpson, Motion Picture Showmen of the Year. In 1996, Bruckheimer produced “The Rock,” re-establishing Sean Connery as an action star and turning an unlikely Nicolas Cage into an action hero. “The Rock,” named Favorite Movie of the Year by NATO, grossed $350 million worldwide and was Bruckheimer’s last movie with Simpson, who died during production. Now on his own, Bruckheimer followed in 1997 with “Con Air,” which grossed over $230 million, earned a Grammy® and two Oscar® nominations and brought its producer the ShoWest International Box Office Achievement Award for unmatched foreign grosses. By the end of the millennium, Bruckheimer had produced “Enemy of the State,” starring Will Smith and Gene Hackman, and “Gone in 60 Seconds,” starring Cage, Angelina Jolie and Robert Duvall, both grossing over $225 million worldwide; “Coyote Ugly,” whose soundtrack album went triple platinum; and the NAACP Image Award-winning “Remember the Titans,” starring Denzel Washington. His peers in the Producers Guild of America acknowledged his genius with the David O. Selznick Award for Lifetime Achievement in Motion Pictures. He began the 21st century with triple Oscar®-nominee “Pearl Harbor.” Starring Affleck, Josh Hartnett and Kate Beckinsale and directed by Bay, the film was hailed by World War II veterans and scholars as a worthy re-creation of the event that brought the United States into the war. In addition to multiple award nominations and the Oscar® for Best Sound Editing, it earned over $450 million in worldwide box-office and has topped $250 million in DVD and video sales. “Black Hawk Down,” the story of the 1993 Battle of Mogadishu, starred Hartnett, Eric Bana and Ewan McGregor and was directed by Ridley Scott. The adaptation of the Mark Bowden bestseller was honored with multiple award nominations, two Oscars® and rave reviews. The Films That Begin With The Lightning Bolt have included “Bad Boys II”; “Veronica Guerin,” starring a luminous Cate Blanchett as the Irish journalist murdered by Dublin crime lords; and “King Arthur,” with Clive Owen starring in the revisionist retelling of the Arthurian legend. In 2004, “National Treasure,” starring Cage and Sean Bean in a roller-coaster adventure about solving the mystery of untold buried treasure, opened to cheering audiences and grossed $347,451,894 million worldwide. “Glory Road,” the story of Texas Western coach Don Haskins, who led the first all-black starting lineup for a college basketball team to the NCAA national championship in 1966, debuted in early 2006 starring Josh Lucas, Derek Luke, Al Shearer, Mehcad Brooks and Emily Deschanel. Summer 2006 brought the theatrical release of “Pirates of the Caribbean: Dead Man’s Chest,” which sailed into the record books by becoming not only Bruckheimer’s most financially successful film, but the highest-grossing movie opening ever in the history of film: $135.6 million in its first three days. Shattering projected estimates, the film earned $55.8 million the first day of release. Seizing $44.7 million on the second day, “Pirates of the Caribbean: Dead Man’s Chest” became the first movie to top $100 million in only two days. The film reunites Bruckheimer with director Jon Turteltaub and stars Nicolas Cage, Jon Voight, Diane Kruger and Justin Bartha, with new cast addition Helen Mirren and Ed Harris. Could the master film storyteller make the same magic in 47 minutes for the living-room audience? Apparently. As Time Magazine recently wrote, “The most successful producer in film history…is on his way to becoming the most successful producer in the history of TV.” Bruckheimer brought the power of the lightning bolt to television in 2000 with “C.S.I.,” starring William Petersen and Marg Helgenberger. It quickly became the number-one show on television, averaging 25 million viewers a week, and, along with its two spin-offs, “C.S.I. : Miami”distinguished as the biggest television series hit on a global scale in 2005 as well as being broadcast TV’s #1 primetime series for the summer of 2006and “C.S.I. : NY,” helped catapult languishing CBS back to the top of the broadcast heap. Bruckheimer Television broadened its imprint by telling compelling stories and delivering viewers in huge numbers with “Without a Trace,” “Cold Case,” four-time Emmy Award®-winning “The Amazing Race” and “Close to Home” on CBS. Bruckheimer consistently has four series listed in the top ten shows on television. In 2004, Bruckheimer made the “Time 100,” a list of the most influential people in the world. Also in 2004, Bruckheimer was named number one in the Power Issue of Entertainment Weekly. The following year, Bruckheimer was the first recipient of the SEAL Patriot Award, in recognition by the SEAL community for his outstanding representation of the U.S. military in motion pictures and television. In 2006, Bruckheimer was honored with a Doctor of Fine Arts degree from The University of Arizona, his alma mater. “Bruckheimer is unique in the industry in that his creative vision spans both large and small screens. We are pleased to recognize his work through this honor,” said Maurice Sevigny, dean of the UA College of Fine Arts. Variety selected Bruckheimer as their Showman of the Year for 2006. This awarddetermined by Variety’s top editors and reportersis presented to an individual who has had significant economic impact, innovations and/or breakthroughs in the entertainment industry. Bruckheimer was presented with the Salute to Excellence Award from The Museum of Television and Radio for 2006 for his contribution to the television medium. And, in 2007, the Producers Guild of America presented him with the Norman Lear Achievement Award in Television for his extraordinary body of work in television. The Los Angeles Times listed Bruckheimer as number 8 in its 2006 The Power Issue, which features the 100 people who wield the most influence in Southern California. Premiere magazine ranked Bruckheimer as number 10 on its list of 2006 power players, while Forbes magazine positioned the producer at 42 on its 2006 Celebrity 100 List. Bruckheimer has been successful in many genres and multiple mediums because he’s a great storyteller. Look for the lightning bolt. The best stories are right behind it. MIKE STENSON (Executive Producer) is president of Jerry Bruckheimer Films for which he supervises all aspects of film development and production. Before joining the company, he was an executive in charge of production at Disney, responsible for many Bruckheimer films including “Armageddon,” “The Rock,” “Crimson Tide” and “Dangerous Minds.” More recently, Stenson served as a producer on “Bad Company” and “Gone in 60 Seconds” and as an executive producer on “Glory Road,” “National Treasure,” “King Arthur,” “Pirates of the Caribbean: The Curse of the Black Pearl,” “Bad Boys 2,” “Veronica Guerin,” “Kangaroo Jack,” “Black Hawk Down,” “Pearl Harbor,” “Coyote Ugly,” “Remember the Titans,” “Déjà Vu” and “National Treasure: Book of Secrets.” Born and raised in Boston, Stenson graduated from Harvard University with a bachelor’s degree in economics and a master of business administration. After his undergraduate stint, he started as a production assistant in New York and worked for two years in independent film and television as an assistant director and production manager before returning to Boston to complete his graduate education. After completing business school, Stenson moved to Los Angeles where he began his tenure at Walt Disney Studios in Special Projects for two years before moving into the production department at Hollywood Pictures as a creative executive. He was promoted to vice president and subsequently executive vice president during his eight years with the company, overseeing development and production for Hollywood Pictures as well as Touchstone Pictures. In addition to the many Bruckheimer films, Stenson also developed several other films and nurtured them through production including “Rush Hour,” “Instinct,” “Six Days, Seven Nights” and “Mr. Holland’s Opus.” While at Disney, many filmmakers attempted to woo Stenson away from the studio, but not until 1998 did he entertain leaving. With his newest position at the helm of Jerry Bruckheimer Films, Stenson spearheaded Bruckheimer’s plan to expand the company’s film production schedule. CHAD OMAN (Executive Producer) is the President of Production for Jerry Bruckheimer Films for which he oversees all aspects of film development and production. Oman produced, along with Bruckheimer, “Remember the Titans,” starring Denzel Washington for Walt Disney Pictures, and “Coyote Ugly” starring Piper Perabo and John Goodman for Touchstone Pictures. His most recent executive producer credits for Jerry Bruckheimer Films include “Glory Road,” starring Josh Lucas, the international hit “National Treasure” starring Nicolas Cage, and “King Arthur” starring Clive Owen and Keira Knightley. He also executive produced the critically acclaimed “Veronica Guerin” starring Cate Blanchett, as well as the blockbuster hits “Pirates of the Caribbean: The Curse of the Black Pearl” and “Pirates of the Caribbean: Dead Man’s Chest,” directed by Gore Verbinski and starring Johnny Depp, “Bad Boys II” starring Will Smith and Martin Lawrence, “Black Hawk Down,” directed by Ridley Scott and starring Josh Hartnett, “Pearl Harbor” starring Ben Affleck, Kate Beckinsale and Josh Hartnett, “Gone in 60 Seconds” starring Nicolas Cage, Angelina Jolie and Robert Duvall, “Enemy of the State” starring Will Smith and Gene Hackman, “Armageddon” starring Bruce Willis and Ben Affleck, “Con Air,” starring Nicolas Cage and John Malkovich, “Déjà Vu,” starring Denzel Washington and “National Treasure: Book of Secrets,” again starring Nicolas Cage. In addition to his work on JBF’s many motion-picture projects, Oman also supervised production on several television projects, including ABC’s drama “Dangerous Minds” starring Annie Potts and the ABC drama “Swing Vote” written by Ron Bass and starring Andy Garcia. Prior to joining Simpson/Bruckheimer in 1995, Oman was a founding employee of the Motion Picture Corporation of America. After six years, he left the independent production company as Senior Vice President of Production. Oman served as an associate producer on “Dumb and Dumber” starring Jim Carrey, executive produced Touchstone Pictures’ “The War at Home” starring Emilio Estevez, Kathy Bates and Martin Sheen, and co-produced “The Desperate Trail” with Sam Elliott and “The Sketch Artist” starring Drew Barrymore and Sean Young. Oman produced “Hands That See” with Courteney Cox and “Love, Cheat and Steal” with John Lithgow and Eric Roberts. Oman graduated from Southern Methodist University with a degree in finance. He also attended the University of California at Los Angeles, where he studied screenwriting, and New York University, where he participated in the undergraduate film-production program. He was born and raised in Wichita Falls, Texas. As a filmmaker for over 25 years, BRUCE HENDRICKS (Executive Producer) has been associated with some of the most prestigious, top-grossing films in motion-picture history. He has a unique position in the entertainment industry, working as both a studio executive and as a producer and director. As President of Physical Production for Walt Disney Studios since 1992, Hendricks oversees all aspects of live-action feature-film production at the company. In this capacity, he has supervised the making of over 200 motion pictures and filmed in more than 30 countries. Among these films are the blockbusters “The Sixth Sense,” “Armageddon,” “The Rock,” and “The Chronicles of NarniaThe Lion, The Witch and The Wardrobe,” to name a few. His credits as Executive Producer are the Jerry Bruckheimer Productions trilogy “Pirates of the Caribbean” and the WWII epic “Pearl Harbor.” His directing credits include the IMAX film “Ultimate X” as well as music videos, television programs and commercials. Hendricks is a member of the Academy of Motion Picture Arts & Sciences, The Producers Guild and the Directors Guild of America. He received an Emmy Award® for his work on the ABC telefilm “The Wave.” A native of Dallas, Texas, Hendricks holds a Bachelor of Science degree in film production from The University of Texas. Hendricks and his wife live in Los Angeles, California, with their daughter, Kyra. ERIC McLEOD’s (Executive Producer) wide range of production experience as a producer, executive producer and unit production manager made him a superb candidate to handle the massive logistics required for mounting “Pirates of the Caribbean: Dead Man’s Chest” and PIRATES OF THE CARIBBEAN: AT WORLD’S END. Just before he boarded the “Pirates” ship, McLeod served as producer of the smash hit “Mr. and Mrs. Smith,” starring Brad Pitt and Angelina Jolie. Academy Award®-nominated writers TED ELLIOTT and TERRY ROSSIO return to “Pirates” for the third time, following their esteemed work on “Pirates of the Caribbean: The Curse of the Black Pearl” and “Pirates of the Caribbean: Dead Man’s Chest.” Elliott and Rossio also wrote the DreamWorks animated feature “Shrek,” winner of the first Academy Award® for Best Animated Film in 2002. In 1992, the pair co-wrote the highest-grossing film of the year, the Disney animated feature “Aladdin,” starring Robin Williams. Their live-action feature-film credits include: “Little Monsters,” starring Fred Savage; “Small Soldiers,” starring Kirsten Dunst; “Godzilla,” starring Matthew Broderick; and “The Mask of Zorro,” starring Antonio Banderas and Anthony Hopkins. In 1996, Elliott and Rossio became the first writers signed to an overall writing and producing deal at DreamWorks SKG. Their animated projects at DreamWorks include “Shrek,” with Mike Meyers and Eddie Murphy; “The Road to El Dorado,” featuring Kevin Kline and Kenneth Branagh; “Antz” (creative consultants), featuring Woody Allen; “Sinbad: Legend of the Seven Seas” (creative consultants), featuring Brad Pitt and Catherine Zeta-Jones; and “Shrek II” (creative consultants), the highest-grossing animated picture of all time. Elliott and Rossio have been members of the Writers Guild of America, West, since 1986. 2007 All rights reserved. Free Movie Entertainment Magazine. All rights reserved. 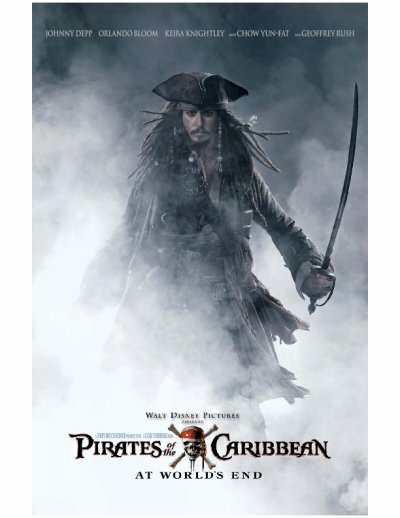 Captain Jack Sparrow's life is in debt to the legendary Davey Jones, Captain of the Flying Dutchmen who are supernatural warriors out for blood. Facing possible eternal damnation, Jack must save himself with help from Will Turner and Elizabeth Swann, who must come to Jack's aid.